Sango Safari Camp - Moremi Wildlife Reserve Accommodation. Our camps have been developed to simultaneously provide the most intimate immersion into Botswana’s unique environment and culture, contribute to the local communities’ development and participate in the preservation of the country’s pristine wilderness areas. Operating in incredible yet fragile ecosystems, it was very important for us to build and manage our lodges with the lowest ecological impact and carbon footprint. We also collaborate closely with the local communities to ensure they can benefit first hand from tourism development and encourage community members to engage with our guests and provide them with a true Botswana experience. This intimate safari camp is named after the Sango Family, some of the original inhabitants of the Khwai area, with whom Bush Ways developed the camp. 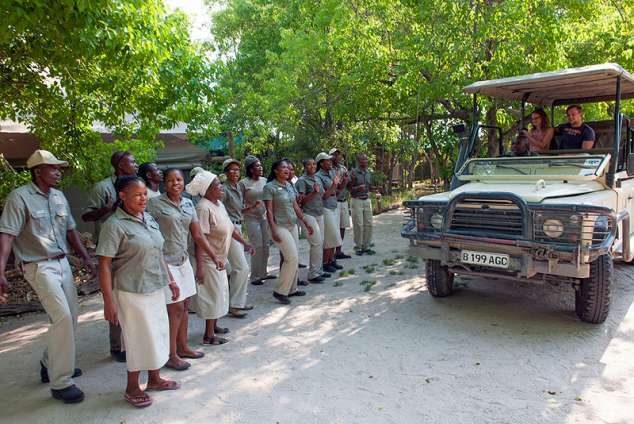 Guests have the chance to learn first hand about the unique lifestyle and experiences that come from living and growing up in one of the most wildlife rich areas of Botswana. Accommodating 12 guests in 6 en-suite meru tents, Sango Safari Camp is designed in the style of the classic tented safari camp of days gone by. With its open-air showers, hand crafted furnishings and classic styling Sango Safari Camp aims to rekindle the atmosphere of the luxury mobile safari camp, successfully blending the rustic with the luxurious. With the Khwai River forming a natural border between the world famous Moremi Game Reserve and Khwai Concession, animals can travel freely through this vast unfenced wilderness, allowing Sango Safari Camp to be focused on delivering an exceptional wildlife experience to our guests. Guests can therefore take advantage of a host of wildlife activities, which include: open vehicle game drives both in the Moremi and in the Khwai concession area, traditional dugout canoe “mokoro” excursions, and night drives. All activities are subject to seasonal availability and weather conditions during the month of travel. PLEASE NOTE THAT A 4X4 IS ESSENTIAL FOR ALL ROUTES TO AND FROM SANGO SAFARI CAMP. 11703 page views since 07 Jul, 2010. Last updated on 15 Jan, 2018.